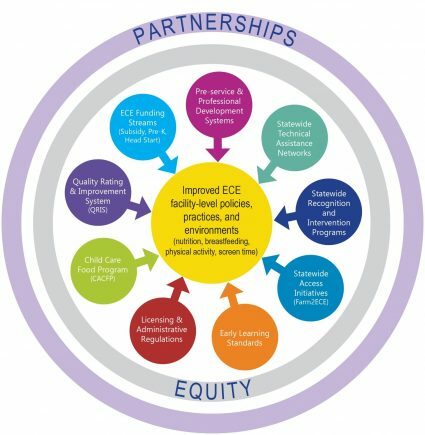 The Spectrum of Opportunities illustrates ways states and communities can support ECE facilities to achieve best practices for childhood obesity prevention. Each opportunity represents a unique avenue to improve nutrition, increase physical activity, support breastfeeding, and reduce screen time. Not all opportunities need to be pursued in each state to achieve impact; however, it is likely that multiple opportunities pursued as part of a coordinated approach will be most effective at achieving desired goals. A number of factors should be considered to help determine which opportunities are viable options to pursue at a specific point in time. Within Licensing and Administrative Regulations, there are several ways to promote healthy nutrition and physical activity. Often times, the first strategy that comes to mind is strengthening licensing standards. While this may be a viable strategy in your state or community, there are several sub-options to take into consideration that extend beyond licensing standards. For more details on sub-options, see the Quick Start Action Guide 2.0 . » Achieving A State of Healthy Weight: National assessment of 47 healthy weight practices present in child care regulations in all 50 states and D.C.
» Child and Adult Care Food Program: On USDA’s website for CACFP, find general information about CACFP, contact information for state agencies, tips for managing CACFP, resources and tools, and more. » CACFP Training Tools: Colorful and engaging materials can be used to empower CACFP providers and operators with knowledge, skills, and expertise to implement the updated CACFP meal patterns. » CACFP Resource Library: There are several free resources to support the implementation of CACFP meal patterns that are specifically tailored for ECE settings. » National CACFP Sponsors Association: A national platform for the CACFP community. Find resources, information about regulations and advocacy, news, events, and conferences. » State Quality Rating and Improvement Systems, Strategies to Support Achievement of Healthy Eating and Physical Activity Practices in Early Care and Education Settings: This review examines the implementation supports states offer to providers through QRIS initiatives to promote healthy eating, physical activity, and nutrition best practices. » Crosswalk of Obesity Prevention Standards in States’ Licensing Regulations and QRIS: States, communities, and other ECE stakeholders can use this resource to identify obesity prevention standards in states’ licensing and QRIS. » Supporting Obesity Prevention in Statewide Quality Rating and Improvement Systems — A Review of State Standards: This review examines the presence of ‘high-impact’ obesity prevention standards present in states’ QRIS. The CDC’s 2016 Early Care and Education State Indicator Report highlights state level data and information about policy and system supports for obesity prevention in Early Care and Education (ECE) settings. The report applies CDC’s Spectrum of Opportunities and a set of indicators to determine to what extent states are incorporating obesity prevention into broader state systems. Among the “Emerging Opportunities and Process Indicators” is an indicator for states with a recognition or designation process for ECE providers, such as Healthy Child Care Center or Breastfeeding Friendly Child Care. As noted by the report, these programs are typically voluntary and require ECE providers to meet predetermined criteria on a particular topic(s) to receive recognition or designation¹. The CDC report indicated there are 24 states with a recognition program for ECE providers.